"I am better prepared. In other years I have had a quiet start. Last year, due to the change of teams, I started a bit further back and was playing catch-up. I hope not to have that disadvantage and want to start better." In his second season as a Movistar rider, Igor Anton wants to find back to his former level. To do this, he has stepped up his preparation and spent two weeks in Lanzarote before Christmas to be in good condition for the Tour de San Luis. 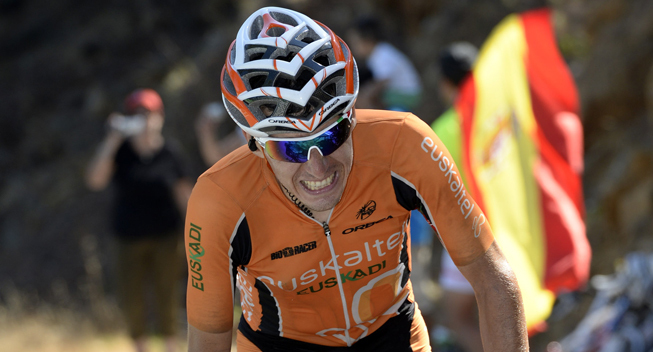 The Basque climber knows that he has to perform better in 2015 and is confident in his ability to do. Igor Anton has started to prepare for the new season earlier than ever before. "I am at an advanced level in my preparation. This year I finished the season early and had a lighter schedule. I started to work in late October. I have been looking forward and looked for good weather in Lanzarote. I was there for two weeks. I had a good memory from 2011 when I last started here - I won on the Monte Zoncolan at the Giro and in Bilbao at the Vuelta, my last two victories - and did not have a bad year. I will try to repeat," he tells BiciCiclismo. "I hope to be in San Luis and to go there with certain guarantees. It is always difficult because people are getting better and are stronger at the start of the year. I should be better in a mountainous race that is not as flat as the Tour Down Under. I don't know how I will be going but I want to go there with guarantees. I prefer to have mountain stages instead of flat stages," he adds. After the Tour de San Luis, Anton will do the Vuelta a Murcia, Clasica Almeria, Vuelta a Andalucia, Tirreno-Adriatico, Vuelta al Pais Vasco, Klasika Primavera and Giro del Trentino. It remains to be seen which grand tours he will do. "I don't know whether I will do the Giro and have had no confirmation. I think it depends on my performance. But I don't lose any sleep. Maybe it is better to do other races and then earn a spot for the Vuelta. The Vuelta would be a very good choice," he says. He has four stage wins in the Spanish race. Anton goes into his eleventh season and wants to start "with a little more guarantees." "I am better prepared. In other years I have had a quiet start. Last year, due to the change of teams, I started a bit further back and was playing catch-up. I hope not to have that disadvantage and want to start better," he says. "When I am good, I have to seize my opportunities because there won't be many during the year. Last year I had my chance in Trentino and the Dauphiné and I was about to seize them. In the big races I liked to do my work. I would like to do the WorldTour races. Nairo [Quintana] and Alejandro [Valverde] will be there in a lot of them but you can also be at a good level to help others," he says. Anton's contract ends at the end of the season but he is not concerned. "I am not strees. I am calm and it is not that aspect which puts me under pressure. It's more about myself. But I would like to have a longer contract. I want to stay quet and do well and then the reward will come. My goal is to be good but not because of the contract or the money. I want to be satisfied. If that's the case, the rest will follow. If I don't get a contract, I won't deserve it. Above all, it is about having a good feeling. I want to regain the enhusiasm which I have missed a bit," he adds. Anton has not won a race since 2011 when he won both on the Zoncolan and Bilbao, and he wants to break his drought. "Winning is always on your mind but it is not essential. My first goal is to be at a higher level. I want to have a great day when I can lift my arms. It is not important where it happens, it is just important to feel personal satisfaction. I want to dedicate a victory to my mother who died in 2014. It is another incentive to try," he says.